They say ~ Salvation for parched lips. This innovative balm coats lips with natural nutrients and skin soothers to condition even the most sensitive lips. Infused with Shea Butter and Vitamins A & E for long lasting protection. I say ~ Well I have to say I am a totally paid up member of the lipsalve addicts club so I know my lip balms. I actually won this one as a prize a while back, but if I hadnt I would have still bought it to try out their range of lip balms. The tube is a little longer and slimmer than an average lipbalm, I feel as if you are getting less product for your money too, as typically lip balms come in a 4g tube. Also with it being an all white stick it does make me feel a little self concious whipping it out in public. The scent, I got the blackberry creme one and it is a nice light blackberry scent. Once applied to the lips the scent doesnt really linger, it feels really slick on the lips its quite nice though and you feel as if it is offering a theraputic condition. After a couple of minuite though it doesnt go away and feels a little bit greasy and while there isnt a taste its still a little bit too oily. It doesnt really sink in to the lips, just sits on top of them where as you would expect a conditioning one to sink in a sort out flaky dry lips. There is no taste or colour to this lip balm either. Over all I dont mind this lipbalm but the packaging and scent arent anything special enough to make up for the odd overly greasy feeling left on the lip. And I wouldnt be encouraged to try out another scent. It is so hard to do on your own hand, especially when your trying to use your non-dominant hand! So somehow I ended up shopping, one of those days where you end up on auto pilot! I am hoping that by getting this darker palette it will satisfy my urge for the much more expensive Urban Decay Black Palette! Also since finally laying my hands on the Barry M Nail Effects I discovered that I dont have any nail polishes in a light enough colour to show up. And finally the orange one is purely for Halloween! Having been dyeing my hair for the past 12 years or so I have tried lots of different variations on black with a hint of other colours. This one is with a deep purple which actually is nice and subtle, I was a little bit worried looking at the picture of the woman on the box but luckily it didn't turn out that bright! I have had my hair this colour now for a month and the dye is still there, as in the shining purple. I still am getting lots of red coming out of my hair when I wash it and I think it will fade out in to a black before long. I don't really mind though because I like having my hair black. My hair is quite thick and is down just past my bra strap (25 inches) and I used a box and a half of this hair dye to do it. Would I buy it again? Well I might do, it doesn't seem to be worse than any of the other ones I have tried and is actually lasting longer than the cosmo blue one from Schwarzkopf which I have tried at least 10 times over the years. Trying another Halloween nail, not sure if it looks any good though. Supposed to be along the lines of blood / vampires. Ended up going with this look. Used a little sponging technique. They say ~ Smitten is made with natural oils, calming chamomile and beeswax to protect the hands from extreme weather or nourish them when they need it most. Use it regularly for nice soft mitts. I say ~ I have a little bit of a soft spot for marzipan and that is exactly what the scent of this product is! First I tried snowcake soap which is a christmas only item and it is amazing as well. This product is available all year round and is really nice and lasts for ages. I did hear though it might be discontinued so be aware of that. So this is a nice cream which is moisturising, it quickly soaks in to the skin and doesnt leave a oily film on my skin. The scent lasts for a couple of hours as well which is always a bonus! It isnt a heavy duty hand cream though so if you have older more drier hands then maybe pick a different product out. As always keep your black pot because if you collect five of them then you can swap them for a fresh face mask! 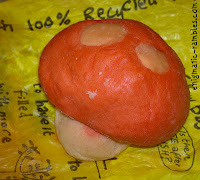 This was a valentines day 2010 special bubble bar combines the scent of yummy yummy yummy and vanillary. I know I am late at getting around to trying it out but still seemed to be quite nice and scented. I thought it looked quite cute actually a little mushroom, I imagine it could be halved and used in two baths but I just crumbled up the whole thing and used it. The overall scent was a sweet one, could smell the vanilla more so than the yummy yummy yummy, although I did always find that scent very weak to begin with. As you can see it turned the bath water a watered down red colour, rather than a pink which is what I imagined it would do. I didn't need to moisturise afterwards and the scent lasted a couple of hours. Don't think I would purchase this again if it were to come out purely because vanillary isn't a fave scent of mine. However for a once a year treat I wouldn't say no! Very nice valentines gift to get from the other half! Bit of a disaster, could have done better zebra print freehanded! Practicing the animal print nails. Still too colourful for me though! They say ~ 17 Lasting Fix Lipstick provides long lasting, non-drying coverage for your lips that lasts up to 4 hours. Dermatologically tested. Fragrance free. I say ~ The lipstick does have a scent but its really slight and is just the normal lipstick scent. Its got to be said that the lipstick is really long lasting, I wore it for about 5 hours before it needed a top up. Its nicely moisturising and is very pigmented although using it as a stain you could easily wear it as a day time colour. It is a nice deep burgundy, purple-y, wine colour. I think it is quite similar to the MAC dark deed or cunning but seeing as I don't own either of these I can't really do a proper comparison. So after a particularly rubbish day I thought I would attempt to cheer myself up with a Lush cocktail. I always like to use sexbomb as the jasmine scent lingers and makes me smell pretty! The comforter is nice at changing the water colour, making bubbles and I thought I would stick a couple of chunks of star melt in too. I think this was a christmas or easter only item, although it is coming up to christmas and so might be back in the shops. It smells like snow fairy / candy fluff and its really nice and moisturising. Over all I like this cocktail, very indulgent though. Made the water exceptionally pink as you can see! Trying out a spider web nail look for a halloween party! They say ~ "Get no smudge, no budge eyeliner that lasts for hours for a fabulous and fresh look of precision. The smooth pen applicator easily glides on color for very fine to bold lines for effortless beauty"
I say ~ Well they claim that its no smudge or budge and I have to agree with that. Once this has dried, and it doesn't take long for that unlike typical paint on eyeliner, it doesn't smudge. I like how you can use it for both thick and thin lines as well. The only problem I had with these pens was that sometimes one line wasn't pigmented enough and so had to go over the line to get a deep colour. These pens are best stored nib down so that the colour is right there in the tip to use when you want. Also the pen dries up quite quickly. Would I recommend it ~ For the price yeah why not, the colours that I chose were nice and they stayed put and dried quickly! Great for £1.50! Thought that I would attempt something matte, subtle french but all black. Not too bad but a little wonky!